Explain the concept of resistivity. Use resistivity to calculate the resistance of specified configurations of material. Use the thermal coefficient of resistivity to calculate the change of resistance with temperature. The resistance of an object depends on its shape and the material of which it is composed. The cylindrical resistor in Figure 1 is easy to analyze, and, by so doing, we can gain insight into the resistance of more complicated shapes. As you might expect, the cylinder’s electric resistance is directly proportional to its length , similar to the resistance of a pipe to fluid flow. The longer the cylinder, the more collisions charges will make with its atoms. The greater the diameter of the cylinder, the more current it can carry (again similar to the flow of fluid through a pipe). In fact, is inversely proportional to the cylinder’s cross-sectional area . Figure 1. A uniform cylinder of length L and cross-sectional area A. Its resistance to the flow of current is similar to the resistance posed by a pipe to fluid flow. The longer the cylinder, the greater its resistance. The larger its cross-sectional area A, the smaller its resistance. Table 1 gives representative values of . The materials listed in the table are separated into categories of conductors, semiconductors, and insulators, based on broad groupings of resistivities. Conductors have the smallest resistivities, and insulators have the largest; semiconductors have intermediate resistivities. Conductors have varying but large free charge densities, whereas most charges in insulators are bound to atoms and are not free to move. Semiconductors are intermediate, having far fewer free charges than conductors, but having properties that make the number of free charges depend strongly on the type and amount of impurities in the semiconductor. These unique properties of semiconductors are put to use in modern electronics, as will be explored in later chapters. A car headlight filament is made of tungsten and has a cold resistance of . If the filament is a cylinder 4.00 cm long (it may be coiled to save space), what is its diameter? We can rearrange the equation to find the cross-sectional area of the filament from the given information. Then its diameter can be found by assuming it has a circular cross-section. The diameter is just under a tenth of a millimeter. It is quoted to only two digits, because is known to only two digits. where is the original resistivity and is the temperature coefficient of resistivity. (See the values of in Table 2 below.) For larger temperature changes, may vary or a nonlinear equation may be needed to find . Note that is positive for metals, meaning their resistivity increases with temperature. Some alloys have been developed specifically to have a small temperature dependence. Manganin (which is made of copper, manganese and nickel), for example, has close to zero (to three digits on the scale in Table 2), and so its resistivity varies only slightly with temperature. This is useful for making a temperature-independent resistance standard, for example. Figure 2. 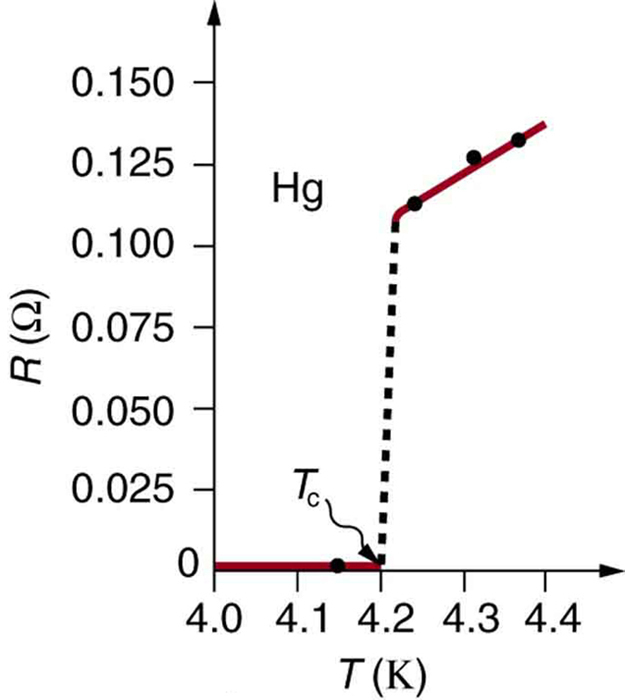 The resistance of a sample of mercury is zero at very low temperatures—it is a superconductor up to about 4.2 K. Above that critical temperature, its resistance makes a sudden jump and then increases nearly linearly with temperature. Note also that is negative for the semiconductors listed in Table 2, meaning that their resistivity decreases with increasing temperature. They become better conductors at higher temperature, because increased thermal agitation increases the number of free charges available to carry current. This property of decreasing with temperature is also related to the type and amount of impurities present in the semiconductors. is the temperature dependence of the resistance of an object, where is the original resistance and is the resistance after a temperature change . Numerous thermometers are based on the effect of temperature on resistance. (See Figure 3.) One of the most common is the thermistor, a semiconductor crystal with a strong temperature dependence, the resistance of which is measured to obtain its temperature. The device is small, so that it quickly comes into thermal equilibrium with the part of a person it touches. Although caution must be used in applying and for temperature changes greater than 100ºC, for tungsten the equations work reasonably well for very large temperature changes. What, then, is the resistance of the tungsten filament in the previous example if its temperature is increased from room temperature (20ºC) to a typical operating temperature of 2850ºC? This is a straightforward application of , since the original resistance of the filament was given to be , and the temperature change is . This value is consistent with the headlight resistance example in Example 1 Chapter 20.2 Ohm’s Law: Resistance and Simple Circuits. Learn about the physics of resistance in a wire. Change its resistivity, length, and area to see how they affect the wire’s resistance. The sizes of the symbols in the equation change along with the diagram of a wire. The resistance of a cylinder of length and cross-sectional area is , where is the resistivity of the material. Values of in Table 1 show that materials fall into three groups—conductors, semiconductors, and insulators. Temperature affects resistivity; for relatively small temperature changes , resistivity is , where is the original resistivity and αα is the temperature coefficient of resistivity. Table 2 gives values for , the temperature coefficient of resistivity. The resistance of an object also varies with temperature: , where is the original resistance, and is the resistance after the temperature change. Figure 5. Does current taking two different paths through the same object encounter different resistance? 3: If aluminum and copper wires of the same length have the same resistance, which has the larger diameter? Why? 4: Explain why for the temperature variation of the resistance of an object is not as accurate as , which gives the temperature variation of resistivity . 1: What is the resistance of a 20.0-m-long piece of 12-gauge copper wire having a 2.053-mm diameter? 2: The diameter of 0-gauge copper wire is 8.252 mm. Find the resistance of a 1.00-km length of such wire used for power transmission. 3: If the 0.100-mm diameter tungsten filament in a light bulb is to have a resistance of at 20.0ºC, how long should it be? 4: Find the ratio of the diameter of aluminum to copper wire, if they have the same resistance per unit length (as they might in household wiring). 6: (a) To what temperature must you raise a copper wire, originally at 20.0ºC, to double its resistance, neglecting any changes in dimensions? (b) Does this happen in household wiring under ordinary circumstances? 7: A resistor made of Nichrome wire is used in an application where its resistance cannot change more than 1.00% from its value at 20.0ºC. Over what temperature range can it be used? 8: Of what material is a resistor made if its resistance is 40.0% greater at 100ºC than at 20.0ºC? 9: An electronic device designed to operate at any temperature in the range from –10.0ºC to 55.0ºC contains pure carbon resistors. By what factor does their resistance increase over this range? 10: (a) Of what material is a wire made, if it is 25.0 m long with a 0.100 mm diameter and has a resistance of at 20.0ºC? (b) What is its resistance at 150ºC? 11: Assuming a constant temperature coefficient of resistivity, what is the maximum percent decrease in the resistance of a constantan wire starting at 20.0ºC? 12: A wire is drawn through a die, stretching it to four times its original length. By what factor does its resistance increase? 13: A copper wire has a resistance of at 20.0ºC, and an iron wire has a resistance of at the same temperature. At what temperature are their resistances equal? (a) Redo Exercise 2 taking into account the thermal expansion of the tungsten filament. You may assume a thermal expansion coefficient of . (b) By what percentage does your answer differ from that in the example? (a) To what temperature must you raise a resistor made of constantan to double its resistance, assuming a constant temperature coefficient of resistivity? (b) To cut it in half? (c) What is unreasonable about these results? (d) Which assumptions are unreasonable, or which premises are inconsistent? 20.3 Resistance and Resistivity by OpenStax is licensed under a Creative Commons Attribution 4.0 International License, except where otherwise noted.